Andrew Lim devises and follows rules for the creation of structures that respond to the architecture and history of sites. He uses objects that have a historical connection to the site in which they are situated, such as objects from the building’s former use or discarded elements found within the building. 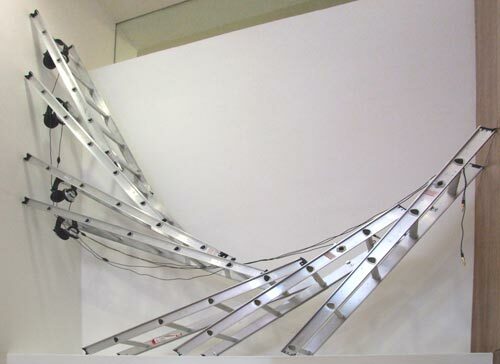 Lim uses mass produced materials to make sculptural installations by devising a set of rules for their construction, and following these rules to their natural conclusion. This is usually when the structural integrity of the form would be compromised and the form would collapse with another iteration of the rule, or when the physical constraints of the site stops the form from being able to grow further. The devising of the rules for growth means that the final form of the structure is determined by itself, giving the work an experimental edge.